A ten-year-old boy was mauled to death by a dog at a seaside holiday park yesterday. A woman accompanied by a dog was later arrested on a train on suspicion of manslaughter 15 miles away in Saltash near Plymouth. The dog has since been transferred to kennels. Police were called to Tencreek Holiday Park after reports of the attack, with paramedics dispatched shortly before 5am. The boy was pronounced dead at the scene. He had been staying in a static caravan at the site. Looe resident Ashleigh Toms, 19, left her home at 6am yesterday and saw both the dog and the woman covered with bloodstains. Ms Toms told The Mail on Sunday: 'I asked what had happened. 'She said she had been on a night out and had been attacked by her boyfriend who she said 'went nuts' at her. 'She asked for my help and for money to get a taxi, saying she needed to go to Saltash. 'I had no money but I said I would be happy to help her get the train, as I was getting it anyway. Ms Toms said she consoled the woman and paid for her ticket for the 50-minute journey to Saltash. Miss Toms said she was shocked to learn of the arrest in Saltash and the tragedy that had happened earlier in the day. 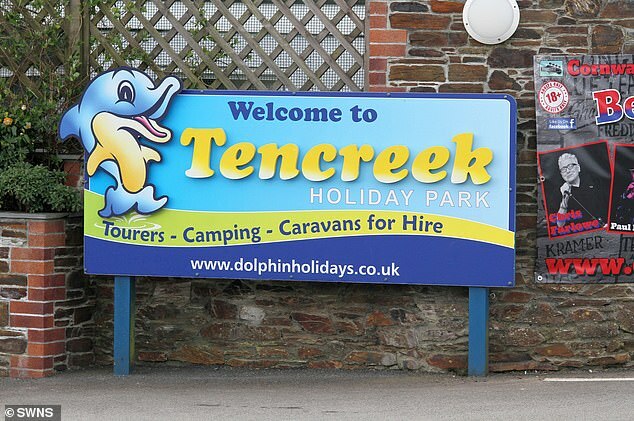 Tencreek Holiday Park describes itself as 'the number one choice for great-value touring, camping and caravan holidays near Looe and Polperro, on Cornwall's stunning South Coast'. Holidaymakers reported hearing screaming early yesterday morning and a spokesman for the park said: 'Emergency services were called to an incident in a static caravan just before 5am. 'Tragically, a ten-year-old child was pronounced deceased at the scene after being attacked by a dog present in the same caravan. 'Our thoughts are very much with the family involved. They have our deepest sympathies. 'He said the park would 'remain open offering normal service'. Devon and Cornwall Police said: 'The boy's next of kin are aware and are being supported by police officers. Following this incident, searches were undertaken to locate the dog and its owner.